It is official: Sprint has confirmed the availability of the Samsung ATIV S Neo on its network on August 16, priced at $149.99 with a two-year contract and after a $50 rebate. Sprint may be on its way to launch the Moto X, but the Samsung ATIV S Neo is going to arrive first. After a lot of rumors, the US wireless carrier has just confirmed in a press release that the handset will go on sale this Friday. 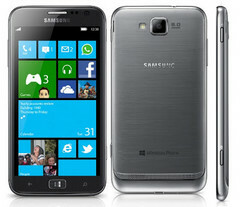 Besides the above, the Samsung ATIV S Neo also features a 3.5 mm stereo jack, 3G/4G LTE mobile hotspot capability and NFC. Being the first Windows Phone 8 handset in Sprint's lineup to feature international roaming capabilities, the Samsung ATIV S Neo carries a price tag of $149.99 (after a $50 mail-in rebate and only together with a two-year service agreement). The handset will be available via Sprint's direct sales channels, including Web Sales, Sprint Stores, Business Sales and Telesales at 1-800-SPRINT1.